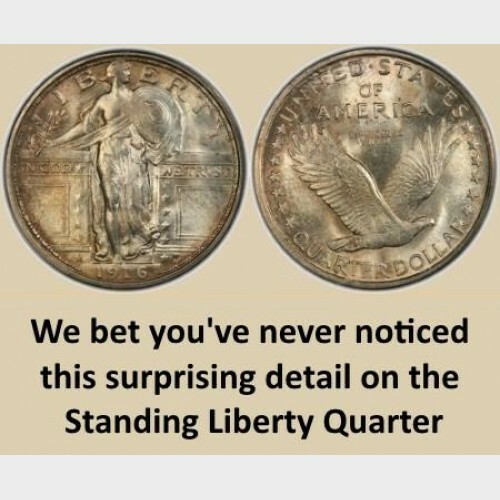 The Standing Liberty quarter features a full head-to-toe Liberty goddess standing in a gateway seen in a defensive posture holding a large oval shield. As this design was created during the first world war, but before US involvement, it is said that Liberty is facing to her left toward the armed conflict in Europe. Hermon MacNeil was an artist well schooled in the classical art forms. Not surprisingly, he depicted Liberty with an exposed breast – a detail disturbing to lingering Victorian sensibilities. During the next year this indiscretion was remedied. In the spirit of the Roman fasces seen on the Mercury dime, the Type II 1917 quarter, and all others until the end of production in 1930, shows Liberty wearing a sort of iron-clad brassiere of, one might guess, considerable discomfort. The bluestocking segment of society was mollified. Another more practical change to the design came about in 1925. The date was further recessed to protect it from wearing off prematurely. 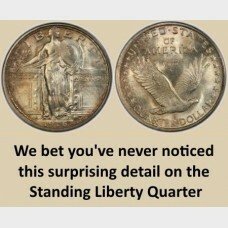 To this day, when examining a trove of Liberty Standing quarters, we may find nearly half are missing dates. The majority of those we see with dates present are dated from 1925 through 1930. Next Blog post will focus on the Liberty Walking Half Dollar of Adolph A. Weinman.